Start Building Your Stable � Get Five Horses Today for FREE! DerbyFever.com is the fantasy horse racing game where YOU OWN a stable of horses, YOU BREED new stars, and YOU PICK the races! In DerbyFever.com , the horses you own and train are based on REAL bloodlines and REAL running styles. 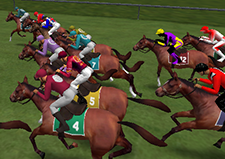 This creates the most accurate simulated world of horse racing available today. There's never a dull moment in DerbyFever.com ! Breed the horse of your dreams and test its racing ability. Race head to head with other players and earn money, points and badges. Experience auctions, claiming and horse ownership, all online at DerbyFever.com ! The DerbyFever.com community consists of thousands of players just like you! Come join the fun!